I will never forget my first experience on a sailboat. I was in my late twenties, a graduate student in San Francisco, having returned to school to study gerontology after several years as a lit teacher in a small college. I had become friends with a fellow about my own age, a really bright guy who was already an associate professor at the university. He was also an unpretentious down-to-earth dude. One morning in the late spring of a year in the early nineteen seventies, he invited me to take a sail with him, just the two of us. I had known for some time that he had a sailboat, a Columbia 26. Even worse, I had shamelessly hinted that I would like to see what sailing was all about. His boat was moored at a small marina in Sausalito, across the Golden Gate from SF. Before we left the dock, Dave familiarized me with some common sailing terms. He was showing a lot of confidence in this untested novice. I listened with rapt attention as he expanded my nautical vocabulary beyond the familiar port and starboard. We sailed out of Sausalito on a gorgeous late spring day. San Francisco Bay is famous for its good winds. That day they were blowing a steady 20 knots. Once clear of the dock, Dave had me take the tiller. After instructing me to keep the bow pointed directly in the wind, he went forward and raised the main. I guess I was a quick study. He gave me a “thumbs up” and proceeded to raise the head sail, a small jib. “Fall off,” he commanded. As he had explained, it meant that I should pull the tiller toward me, moving the boat in the opposite direction, so that the wind would fill the sails. The boat heeled over to about twenty degrees off horizontal. Our skipper gingerly crept back to the cockpit along the high side, one hand on the grab rail atop the cabin. Always one hand for the boat when on deck, my first lesson in safe seamanship. Entering the cockpit, he hit the kill switch on the outboard and took the tiller. “Good show. Keep at it and you’ll make a passable sailor,” he complimented. The engine, the auxiliary in sailboat speak, ceased firing and the only sound was the water rushing by the hull. The Columbia rode the waves, rising and falling. I sat on the high side of the cockpit, my feet braced against the opposite seat. Every few minutes, the wind sent spray over the bow, giving us a light shower. It was exhilarating. The view was magnificent. We were sailing toward San Francisco. Turning my head, I could take in the famous skyline. Directly before me was the Golden Gate Bridge. Seeing these from the water, feeling the motion of the boat, I experienced an elation of emotion unique in my young life. Three hours on the water and the sail was over much too soon. The whole experience was indescribable. There might just be a reason for all those hours at the graduate student grindstone. My ticket to a reasonably good job and the cash to buy my own sailboat. A year later I graduated and took a job in Seattle Washington. I bought that first boat, also a Columbia, a year later. Let me be clear: That Seattle is considered the boating capital of the United States when measured by the proportion of sailboat owners to the overall population played absolutely no part in my decision. Well, if you believe that, I’ve got a bridge I’d like to sell you. Over the years I’ve owned and loved four sailboats. I never was what is known as a blue water sailor, nor was I ever hooked on racing. I was a cruising sailor, enjoying weekend sails to familiar anchorages and two or three week cruises in the summer. Nonetheless, sailing has defined my life as much as, or maybe more than my career in the field of aging services. 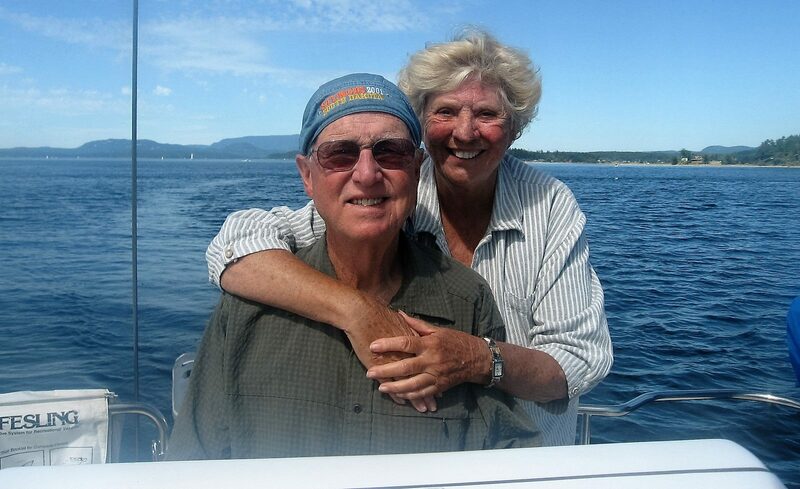 Even after I retired at age 68 and moved to Tucson, I and my late-life-love would journey to the Pacific Northwest for a month or two that included a good dose of sailing.